Your dog can enjoy red, ripe tomatoes in moderation, but there's a catch. If you can't get enough tomatoes in your life, you're not alone. According to the United States Department of Agriculture, Americans individually consume more than 22 pounds of tomatoes every year—and, yes, the majority of that is in ketchup and tomato sauce. A less shocking fact: Where there's food, there's your dog, and you might be wondering if you can share the deliciousness with your four-legged friend. 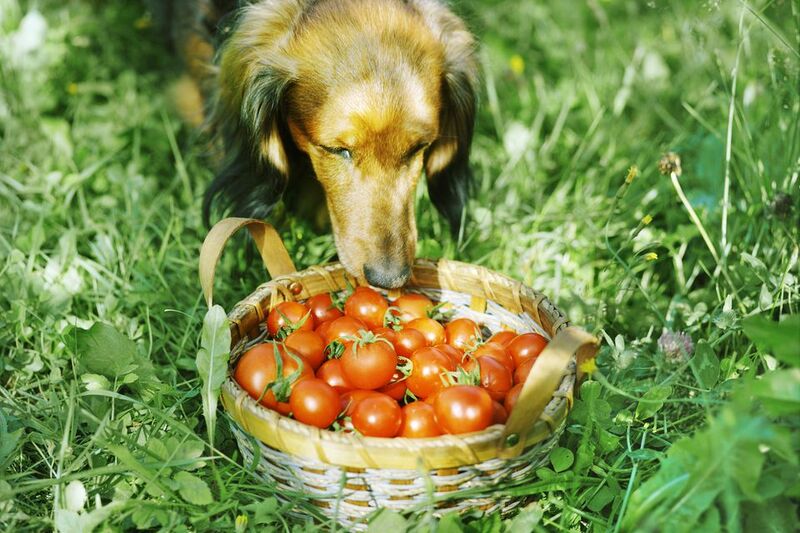 Experts agree that while your dog can enjoy a bit of tomato every now and then, you will definitely want to keep him or her out of your garden, and here's why. Tomatoes are part of the nightshade family of vegetables. These plants contain toxic elements but still bear edible parts, and also include peppers, eggplant, and potatoes. That means that while tomatoes do contain many health benefits for your dog and can be given as an occasional treat, the plants themselves can be toxic. Tomatine is a toxic substance found in the stem and leaves of the tomato and similar plants, and it's a form of solanine, which is common to all plants in the nightshade family. When consumed in large quantities, it can be poisonous to our beloved pets. The good news: Solanine is mostly concentrated in the green part of the plant, which means that ripe tomatoes are generally considered safe for dogs to snack on. Pet owners should keep in mind that the leaves and stems of the tomato plant—as well as the young, green tomatoes—contain up to five percent tomatine and are highly toxic to dogs, so you’ll want to keep a close eye on your dog whenever he or she has access to your garden. While poisoning from eating tomatoes is rare, you’ll want to exercise caution when introducing tomatoes into your dog’s diet. The most common symptom of tomatine poisoning is severe gastrointestinal distress, such as diarrhea or vomiting, but some dogs may also exhibit symptoms of lethargy, loss of coordination, seizures, muscle weakness, or even behavioral changes and an abnormal heart rate—and you will need to seek immediate treatment from your pet’s veterinarian. Just like in humans, tomatoes can also aggravate certain gastrointestinal issues, such as acid reflux, so it’s always a good idea to consult your veterinarian before offering your dog tomatoes. Tomatoes also happen to be a common allergen in humans, and your dog can have a similar reaction. While it’s rare, an allergic reaction could lead to anaphylaxis, which is potentially life-threatening. The symptoms include typical allergy reactions like coughing, sneezing, or hives—you may notice your pet licking their paws or scratching their skin—with more alarming symptoms including swelling or difficulty breathing, which all require treatment from your pet’s veterinarian. What About Ketchup, Tomato Sauce and Other Tomato-Based Products? If your dog loves chomping on fresh tomatoes, keep in mind that while he or she may also show interest in that pizza slice or spaghetti that you’re eating, products containing tomatoes aren't typically safe to offer. Tomato sauces, soups, or juices aren’t particularly healthy for dogs because of the added salt and sugar, as well as artificial flavors or other chemicals. Homemade tomato-based products like sauce likely won’t cause harm, but it’s still best to avoid feeding them to your dog because any products that contain even a trace of unripened tomatoes can put your dog at risk. When offered to your pet safely and in appropriate quantities, tomatoes provide some health benefits. Tomatoes are chock full of nutrients, including the carotenoids lycopene and beta-carotene, which can help your pooch fight off diseases like metabolic syndrome, heart disease, or stroke, promote strong, healthy bones, and improve cognition. The low-calorie fruit is also high in fiber, which aids digestion, and tomatoes are rich in vitamin A and C to help boost your pet’s vision and promote healthier skin. Minerals like folate, chromium, and potassium in tomatoes can improve blood pressure and strengthen your dog’s nerves and muscles. When offering your dog tomatoes, you’ll want to look for mature, ripe, red tomatoes (cherry tomatoes and other varieties are also fine) that have all of the stems, leaves, and vines completely removed. When purchasing from the grocery store, choose organic whenever possible to avoid any harmful effects from pesticides, insecticides, or herbicides. While many people prefer their tomatoes salted, these types of additives can be very harmful to your dog, so small pieces of a plain, thoroughly washed tomato—preferably with the skin removed—is always the safest way to serve them to your pet. As a general rule of thumb, feeding slices of one red, ripe tomato as a weekly treat will ensure that your dog reaps the nutritional benefits without exposure to the dangerous effects from the tomatine.